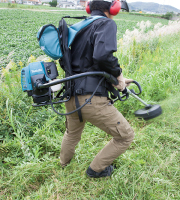 Makita 4-Stroke Engine delivers high torque and horsepower. Max. 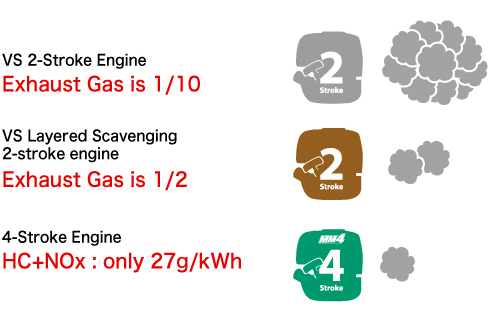 Torque and horsepower of Makita 4-Stroke Engine are almost the same as those of an equivalent 2-Stroke engine as shown below in the chart. Compared with the conventional 4-Stroke Engines, Makita 4-Stroke Engine produces approximately 20 to 30 % more power thanks to its high combustion efficiency and new developments such as compact spark plug. 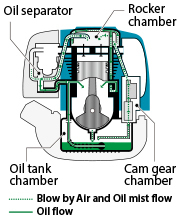 Additionally, by employing a unique lubrication system, it has obtained the smallest in class exterior physical dimensions among the 4-Stroke Engines available in the market today. Patented Unique Lubrication System enables to use 4-Stroke Engine in Full Multi-position. Employing this system enables to use 25.4mL Brushcutters on any slope such as ditch slopes, river banks or mountain woods. The natural pressure changes in the crankcase caused by the piston movement in the cylinder are harnessed to pump the oil throughout the engine. Oil is pumped from a reservoir in the base of the engine through a network of one-way valves for reliable lubrication and long service life without the need to keep the engine level. 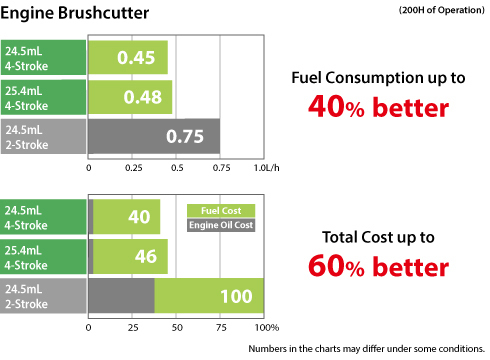 From our comparison test between Makita 4-Stroke Petrol Brushcutter and an equivalent 2-Stroke Petrol Brushcutter, the superiority of Makita 4-Stroke Engine over 2-Stroke Engine in its class has been proved both in fuel consumption and total cost as shown in the charts below. 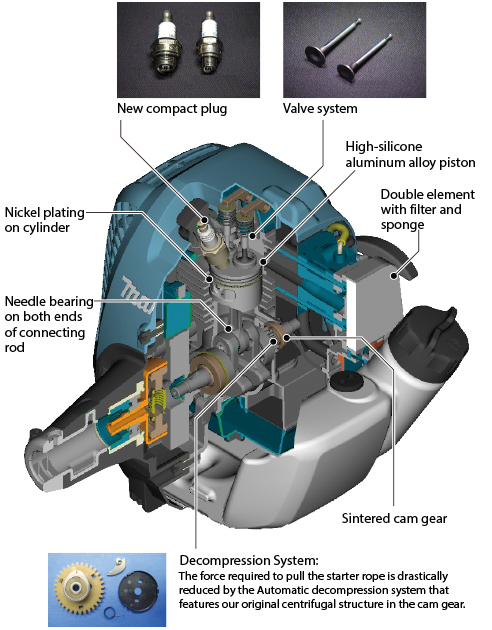 Makita 4-Stroke Engine uses straight unleaded gasoline. Low noise level allows to operate without disturbing others even in quiet places such as parks or residential areas.